Mover Over Rover and Let Matt Grover Take Over! You are here: Home / Contest / Mover Over Rover and Let Matt Grover Take Over! 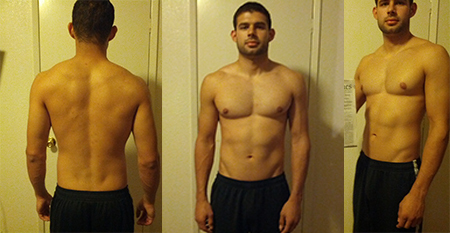 Today John talks to Matthew Grover who placed 7th in our last 12-Week Transformation contest. Matt is a prime example of someone who has eliminated excuses and used the Adonis Golden Ratio (AGR) Systems as a tool to ensure there is a top-priority when it comes to his nutrition and fitness goals. Read on to find out how a former hard gainer, learned the difference between proportions and just sheer size. How old are you? I am 25 years old. When did you first start working out? If it was before finding Adonis Golden Ratio (AGR) Systems can you briefly explain the types of programs/workouts you did before finding AGR? I served in the US Army for 6 ½ years so physical training has always been a big part of my lifestyle. It wasn’t until I became a recruiter for the Army the last couple years of my enlistment that I began to pack on the pounds in a bad way. This happend to me indirectly because physical fitness wasn’t very high on the priority list for that particular job. Once I started to get back into working out I didn’t really have a set plan, I just threw together work outs and ultimately had no real direction. Not any in particular, I sort of fell into the bulking trend because I have always been a hard gainer. Knowing what I know now though would have made a world of difference in what and when I ate. I read Johns article in Men’s Health back in 2008 and was interested in the concept of proportions over sheer size but at the time had a lot on my plate. I rediscovered it again in 2011 by browsing around the web and stumbling across an article that caught my attention. To challenge myself. I always found it very difficult to follow a fitness plan, and with this I wanted to prove to myself that I could put a little more dedication into it, because in the end I would be showing off what I had trained for. To keep a routine going and not make any excuses as to why I could not go to the gym. If I absolutely couldn’t make it one day, I had to make it up another. No exceptions! That and following a stricter diet, combined with routine fasting made it a challenging but still doable. With only an hour to spare, the workouts are quite doable. Even the longer workouts don’t go over an hour and a half. The gym I attend is open till midnight so I would always go around 10 at night so that there aren’t that many people and I can have access to the equipment I would need. I did my best to cut out sodas, candy, and fast foods. I also implemented intermittent fasting into my daily routine, only eating between the hours of 6 and 12 at night. At first the most challenging was cutting out all the junk food I was hooked on eating. It took a few weeks to be able to get my cravings down to a manageable level. I was also following the reverse taper diet and I noticed more and more that it was rather difficult to meet my daily caloric intake. The answer was simple, eat more. However, with trying to avoid most junk foods it became relatively difficult. They were quite surprised with how it began to look. My parents especially, I remember them asking me if I was taking steroids because of how much size I was putting on. About a month and a half into the contest I began to notice my back muscles were more defined and what body fat I had left was slowly disappearing from the rest of my body. My thighs in particular are where I noticed a rapid change. They were always undefined and a little on the squishy side. Mission Accomplished! I felt as though maybe I could have done a little better in the size department, but the change is there and I know now what it takes to buckle down and stick with a good nutrition and training routine. It is an excellent learning experience on just how rapidly your body can change if you commit to it. I think everyone who has a vetted interest in their personal physical appearance should enter at least one AGR Transformation Contest. I’m going to keep at it! Since the end of the contest I have made it a point to start lifting heavier than I am used and it has made a huge difference in my overall size. I plan on entering the latter contest this year, once the changes that are happening in my life calm down. Hopefully I’ll see even more gains. If your hooked on junk foods, spend some time here cutting down the amount your eating and get your cravings down to a manageable level. Use the Reverse Taper Diet to achieve your daily calorie goals and adjust as needed. Implement fasting into your daily routine. Pick a set time during the day when you will allow yourself to eat your meals. If possible attend the gym during non-peak hours to ensure access to the equipment you’ll need. Challenge yourself! Anyone who has a vetted interest in their personal physical appearance should enter at least one AGR Transformation Contest.